DEVELOPER Harry Triguboff, buoyed by robust demand for rental apartments, is hastening the sales launch of a $3 billion community at Pagewood in Sydney’s Eastern Suburbs. Pagewood Green will be the biggest project undertaken by the 83-year-old Meriton group founder, Australia’s richest person, in a property career that started in the early 1960s. The master-planned mixed-use development, neighbouring Westfield Eastgardens will evolve on a former British American Tobacco and Holden site and will include more than 3000 apartments over ten years. It will be the largest new residential project in the Eastern Suburbs and a face-changing one for Pagewood. Mr Triguboff yesterday said that Pagewood Green would provide some of the most spacious apartments in the area. The launch of stage one, with four towers of up to 20 levels, has been brought forward by several weeks to September by the Meriton group. 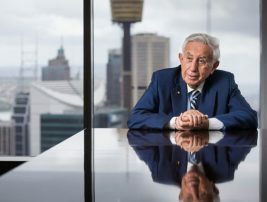 Mr Triguboff, in May named Australia’s richest person said the early release was a response to an ever-growing appetite from owner-occupiers and tenants alike for ‘shiny new’ and spacious apartments in a lifestyle setting and within easy reach of the Sydney CBD. “We’ve almost been caught off guard by the rental demand we’re experiencing for our projects, especially from families, in areas like Mascot, Zetland and Waterloo. “Investors are delighted — rents are up 5 per cent. “Pagewood will be the same and investors will be chasing the rental returns. “It’s a suburb with a lot of atmosphere and we’re going to make it even better. “We’re putting in nearly two hectares of parkland, tree-lined boulevards, and a civic square for alfresco dining. Mr Triguboff said he expected Pagewood’s proximity to the proposed light-rail stop Kingsford – it will be 10 minutes away – to add another dimension to the suburb’s appeal. Meriton bought 10.5ha of the Pagewood Green site for $140 million in 2013 and bought a further 6ha for $90 million in 2015. The larger portion has approval for 2223 apartments and up to 5000sqm of retail space. Pagewood Green is to be developed in multiple stages, with design competitions run for each stage in consultation with the Botany Bay City Council. A panel selected the design of award-winning SJB Architects for Pagewood Green’s first stage release, Allium. SJB director Nick Hatzi yesterday said that part of SJB’s design strategy had been to enhance the pedestrian experience and contribute positively to the new streets and landscaped pedestrian links to provide a permeable and walkable neighbourhood. The Allium towers, overlooking The Lakes golf course and out to the city, will range from 16 to 20 storeys and house 487 apartments, many of them targeting the family market with large three bedrooms. There will be central-podium gardens on level five, above-ground parking, pool, spa, sauna and gymnasium. A new street through the Pagewood Green site will link Bunnerong Road to Banks Avenue and is proposed to host a number of bus stops to link the routes from the bus interchange at Westfield, Eastgardens. Meriton will upgrade the intersection of Bunnerong and Heffron Roads and also is funding the council’s upgrade of the Wentworth Avenue and Page Street intersection with a $10.5M contribution. 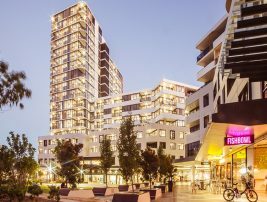 Meriton is expected to retain some of the Pagewood Green apartments but, with the imminent completion and opening of its serviced apartments at Jackson Drive, Mascot, it is yet to decide whether it will include serviced apartments in the project.